Last week Saba Ahmed became yet another Muslim punching bag for the right, who refuse to listen to her game-changing plan to fight extremism. 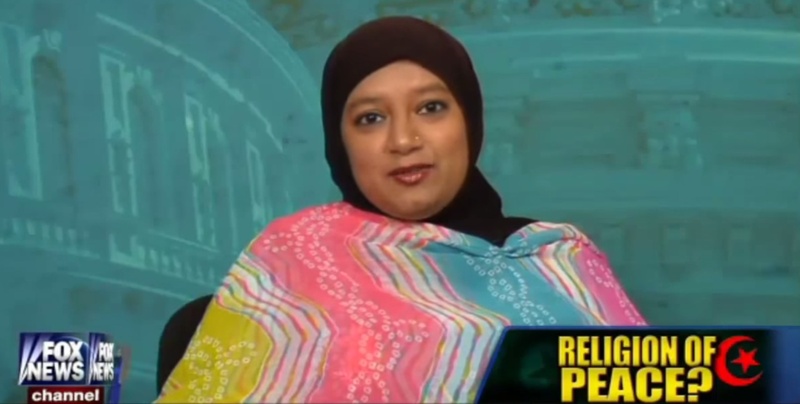 On June 16, Saba Ahmed became instantly famous when a video of her questioning panelists at a Heritage Foundation event on the Benghazi consulate attack went viral. During the Q&A portion of the event, the American University law student asked the panel why they paint all 1.8 billion Muslims with the same jihadist brush, and how they expect to change jihadist ideology through military force. If the Heritage Foundation panelists or Sean Hannity had allowed Ahmed to continue, she could have explained just how urgently relevant her message is—especially at a time when extremist groups like the ISIS are becoming increasingly powerful. In this interview, we discuss the Heritage Foundation panel and how the solution to extremism might be found in Islamic scripture. This interview has been edited for clarity and condensed. In an article for The Washington Post in response to your experience, you wrote, “The radical extremist ideology can only be changed by the tolerant moderate peaceful teachings of Islam if we are to ever win this war.” What kinds of teachings? There is one verse [in the Koran] that says there is no compulsion in religion. You can’t force people to convert. The religion depends upon faith and will. And it would be completely meaningless if it’s induced by force. The verse is 2:256. There are a lot of peace verses. 60:8: This verse specifically talks about dealing with non-Muslims. The Koran states that we have to deal kindly and justly with those that don’t fight us. So how can anybody living in the Western world justify fighting? Verse 5:32 is about how life is sacred, and how if you take one innocent life, it’s as though you’ve killed all of humanity. And if you save a life, it’s as though you’ve saved all of humanity. Your piece in The Washington Post also mentions a lobbying firm that you started. Can you tell me more about it? During these hearings, do you find anything that people consistently get wrong about Islam? My hope is that in the future we have some Muslims testifying at these hearings and in Congress, because there seems to be a huge lack of understanding. A lot of our policies are misguided, targeting an entire religious group. I’m amazed when we go to these congressional hearings. They’re asking for hundreds of millions of dollars for the State Department budget on outreach towards counterterrorism. Out of all that money, we couldn’t hire one person who knows the Koran? Every time I go to congressional hearings, again it’s budget talks. They keep on asking for more funds, and we keep on funding them. But they’re not addressing the root causes of problems. How should we address these problems? I just met this lady [Mossarat Qadeem] who was here from Pakistan. She is in the northern areas where young boys were going to the hands of the Taliban, doing horrible things. The last four years she was saying she [and her organization, Paiman Alumni Trust] converted 1,500–2,000 boys from going into terrorism to being productive citizens of society. To change their minds, she just used their mothers. They talked to the mothers about the boys going into potentially violent things and they worked with others to provide education or jobs or other things for the boys to do. Because they were sitting at home and they just once a week they would go to some madrasa or someone who’s inciting them into violence. They’re young and stupid, so they fall into it. She’s been able to bring them out of that nonsense and able to help them get de-radicalized. They’ve already done the development work. We don’t need to repeat it. They have all the information about what verses work. What has been working with boys; what has not been working. We just need to expand that. Was there anything you wanted to say to the Heritage Foundation panelists or Hannity that you didn’t get a chance to say? I definitely want to work with them. And hopefully that means with mutual respect and dignity because I’m not going anywhere and I don’t think they are either. We’re both going to be here in the country, so why don’t we figure out a way to work together? Hannah Harris GreenHannah Harris Green is a Summer 2014 intern at The Nation and a journalist interested in South Asia, human rights and the media. Words in VICE, The Guardian and The Los Angeles Review of Books and on Twitter: @write_noise.